Eaton Canyon Natural Area is located at 1750 North Altadena Drive, one block north of New York Drive in Pasadena, California. There is a sign on the east side of the street which clearly marks the entrance to the Park. From the 210 Freeway eastbound, exit at Sierra Madre Boulevard/Altadena Drive. Turn left (north) at the first light (Altadena Drive) and go 1.6 miles to the park entrance. From the 210 Freeway westbound, exit at San Gabriel Boulevard/San Marino. Turn right (north) at the second light (Altadena Drive) and go 1.5 miles to the park entrance. Click on 'View larger map' for personalized directions. Nature Center & Museum: open daily from 9-5 except: Mondays, Christmas Day, and New Year's, but open on other Monday holidays. 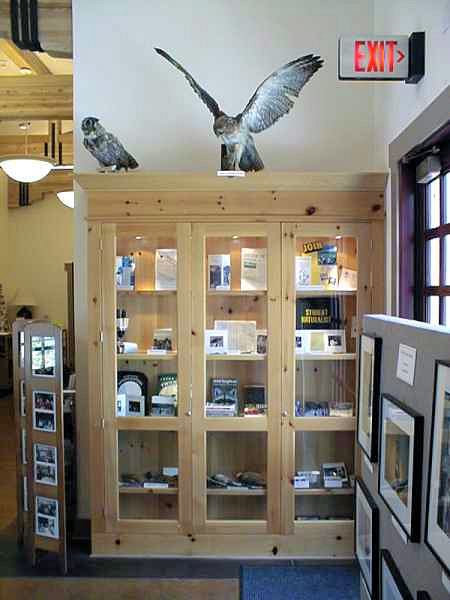 It looks as though our display case is being guarded by a great horned owl (left) and a red-tailed hawk (right), but don't be afraid. Inside you'll find many items of interest, including a large beetle, mounted insects, booklets, and a photo and information on bird banding (attaching bands to their legs, which does not harm the birds and allows them to be monitored for their safety and preservation). Hope you enjoyed our tour!